A few years back an Olympus executive made the statement that digital cameras really only needed 12mp and implied that Olympus wouldn’t go further than that with m4/3. Of course, we’re at 16mp now with m4/3, so that didn’t exactly work out as expected, did it? But the question keeps coming up, and will come up again in September when we see at least one of the current 16mp mirrorless producers move to 24mp (and, of course, Canon APS and Nikon 1" are already at 18mp, while Samsung is at 20mp APS, and Sony is at 24mp in APS and 36mp in full frame). What do we really need in terms of megapixels? Do we need to go further than we currently have? That answer isn’t particularly easy to come up with, as it turns out. Let’s start with the “optimal” shooter. This person has the lenses they need, composes carefully in the field, understands their camera’s dynamic range and how to maximize it, and is a good post processor of raw data. What can they currently do with 16mp (m4/3 and APS)? Do these users need more than 16mp? Likely not. Looking at the above list, most everyone in the optimal shooter category would probably say that would want better focus (bullet 5) or perhaps better low light capability (bullet 3) before more pixels (bullets 1 and 2). What would they get from more pixels? Larger print sizes, basically. Possibly more edge acuity at the same print size. Though these would have to balanced against issues that might arise from using smaller photosites, e.g. noise. Sensor technologies do get better with regularity, so the noise issues would probably be mitigated somewhat with time. So the question becomes this: how many of you really want to print bigger than you currently are? You landscape photographers don’t get to vote on this as you could almost always use stitching to create larger images and image stacking to deal with dynamic range, and that would arguably give you better results than more pixels on the existing sensor. I don’t see a lot of hands go up when I ask this question these days. Not nearly as many as I did 10 years ago, when most hands went up. My hand also doesn’t go up. I’m perfectly happy with what the Olympus E-M1 gives me when hiking deep into the backcountry. If anything, my focus has shifted to what lenses I’m carrying and why. Same would be true if I were using a Fujifilm X-T1 for these hikes. 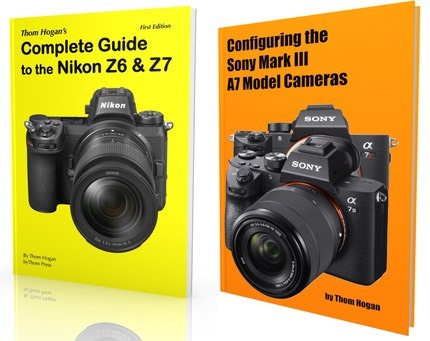 The Sony A7 would be more than enough at 24mp full frame, too, though given that the A7r is almost an identical camera, the temptation is to go with its 36mp. Note that I didn’t: I returned the A7r and only kept the A7. Enough pixels are enough, and the A7 has better focus performance and doesn’t have the shutter slap issue of the A7r. Okay, what about the “non-optimal” shooter? First, I guess I have to explain what I mean here. The biggest category of non-optimal shooter is what I call the “heavy cropper.” They take shots with wider-than-needed lenses and then attempt to discover the picture via cropping in the digital darkroom. Yes, I know there are times when you simply have to shoot this way—many sports shots I make require cropping simply because I can’t be in the position with the necessary lens to get the shot I really want. But I’m talking about the person who tends to shoot casually with the kit lens, tends to stand back from their subjects, and when they get home they look to discover whether there’s a better shot in the one they took, and thus starts cropping. Do they need more than 16mp? In one sense, yes. If you’re taking a 4608 x 3456 pixel image and using crop tools to make it 2400 x 1800, then you’d probably rather have 24mp or more to start with. Maybe. Are these non-optimals printing large? Probably not. Most are sharing via the Internet as far as I can tell. But even in the example I just gave they could get an 8” print without resizing and probably an 11” print with resizing. To a large degree, the Olympus executive was right: 12mp is a good stopping point for many. If you’re using all those pixels, you can easily print an 8x10” print, probably do quite fine to 11x14”. The thing is: not a single maker—even the one that suggested they would stop—has stopped upping the pixel count in their cameras. To some degree, that’s because there’s a marketing war going on. 24 is better than 16. IS is better than none. Smaller is better than larger. In almost every realm you look at with cameras, the camera makers are looking to find simple to understand bullet points that allow them to market against competitors. Everyone understands numbers, right? Bigger is better. Which brings us to the problem. In DSLRs Canon is at 18mp minimum, and Nikon is now pretty much at 24mp minimum (the pro D4s and the oddball Df notwithstanding). Those two companies sell a majority of the interchangeable lens cameras, and that hasn’t changed since the 1980’s. So if you’re going to sell against those power brokers, you need to be able to say “we can match them” plus “we have other attributes that are better” (usually smaller, lighter). So the mirrorless makers (except for Sony and maybe Samsung) are in a quandary. You really need 24mp to match Nikon DSLRs. You really need fast phase detect autofocus to match DSLRs. Those two things are currently perceived as “lagging” in most mirrorless cameras. So selling a mirrorless camera becomes more about do the benefits (size, weight, lens lineup, etc.) outweigh the duopoly consumer DSLRs’ benefits (megapixels, focus speed, etc.)? The answer at 12mp and contrast detect autofocus was mostly “no." The answer at 16mp and nascent on-sensor phase detect autofocus has been “almost.” That’s still a problem when the mirrorless cameras are trying to command a premium price. Which means we’ll see 24mp cameras with improved autofocus from the mirrorless cameras soon. Sony’s already basically there with the A6000, though they shot themselves in a toe by coming out with the new FE mount, which slowed E mount lens development to a halt. I’d tend to say that 16mp was enough. But that won’t stop the floodgates of more megapixels. Photokina in September will take at least one, and as many as three of the current mirrorless players, up to 24mp. Oh, wait, he sang “book" not “camera.” Still, it seems like good advice. While some of you are waiting around for 24mp, there’s nothing at all wrong with the 16mp cameras we’ve got today. It’ll take far more than a change in a number to change that.